From the moment you land at Entebbe international airport, with its breath taking strategic location on the forested shore of island strew in Lake Victoria, it is clear that Uganda is not an ordinary safari destination. Dominated by an expanded golf course leading down to the shores of the Lake Victoria and an old botanical garden with a chatter of acrobatic monkeys and colorful tropical bird species, Entebbe its self is least urban of all compared to the other sized Ugandan towns. At Just 40km distance, sprawled across seven hills lies the capital Kampala city with its bright modern feel of bustling and cosmopolitan city reflects the ongoing economic growth with political stability that has featured in the country. Ecologically, in Uganda is where the East African savannah plains meet the great West African jungle. Where else on this continent but its possible for one to observe lions prowling in the open savannah plains in the morning and on that day track chimpanzees through the tropical rain forest in the afternoon of the same day, then next day do a navigation on the tropical channels teeming with the yawning hippos and basking crocodiles before setting off into the misty mountains to stare into the amazing eyes of the elusive mountain gorillas. Uganda is the only destination whose range of primates is as impressive as its selection of antelopes in its savannah plains. 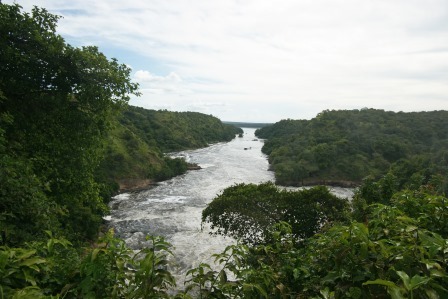 There is more in this country than wildlife: there is the mighty river Nile that is punctuated by spectacular Murchison falls ‘the world’s strongest falls’ and setting some of the world’s most thrilling white water rafting. The snow covered peaks of the Rwenzori Mountains which also provide a challenge to dedicated and passionate mountaineers as well as the virunga circuit and mountain Elgon, both of which offer rewarding hiking opportunities through highland scenery. More interesting, the myriad islands of Lakes Victoria and Bunyonyi are ideal venues and the myriad of forest fringed crater lakes that are stranded on the rift valley floor. Whether you are a first time safari traveler or a seasonal African traveler, a Uganda safari with its unique blend of savannah, forest creatures, and its wealthy montane and lake habitats are simply dazzling.